At Tempo Dance Company we cater for all ages and abilities. All levels of experience are welcome to come and learn to dance, from beginners to advanced. Tempo prides itself on offering expert tuition in all aspects of dance, with a range of dancing styles including jazz, tap, hip hop, classical ballet, pointe ballet, lyrical / contemporary, fairy ballet, stretch and technique, pointe prep, cheerleading, acrobatics and pre school classes. Throughout the year students are also provided with the option of completing dance exams enabling them to strive for individual greatness. Selected classes are also entered into various competition days each year, with Tempo Dance Company gaining some great results in past years. Our experienced and caring staff help children achieve their best while fostering a love of dance in a fun and friendly atmosphere. We aim to provide each student with the key skills and abilities required in order to fulfil their goals and needs. Tempo Dance Company aims to provide a studio that helps children develop their self confidence, self image and how to work in a team environment. Most of all, our classes are fun! The reward for us is to see our students having some great times whilst learning and expressing their individuality in a creative and positive manner. Factory 4 / 14 Edina Road Ferntree Gully each weekday and Saturdays. We have a fully equipped studio with barres, mirrors, parents waiting area, air- conditioning and heating. Ample off street parking available. At Emerald we have a great studio setup. Parents waiting area, fans and heating. Ample off street parking available. At Clematis we have a great studio setup. Parents waiting area, fans and heating. Heaps of off street parking available. 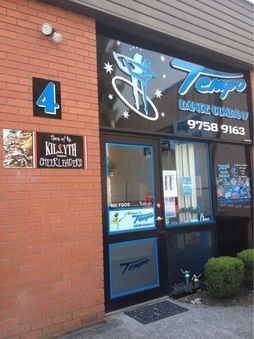 We have students at Tempo Dance Co. who come from Ferntree Gully, Boronia, Rowville, Lysterfield, Knoxfield, Scoresby, The Basin, Croydon, Bayswater, Bayswater North, Kilsyth, Chirnside Park, Mooroolbark, Lilydale, Upper Ferntree Gully, Wantirna, Heathmont, Vermont, Mitcham, Dandenong Nth, Upwey, Tecoma, Selby, Menzies Creek, Clematis, Cockatoo, Avonsleigh, Macclesfield, Gembrook, Emerald, Narre Warren, Endeavour Hills, Park Orchards, Pakenham and even Drouin. Tempo Dance Company is a fully registered dance school with the Australian Academy of Theatrical & Ballet Dancing Inc.